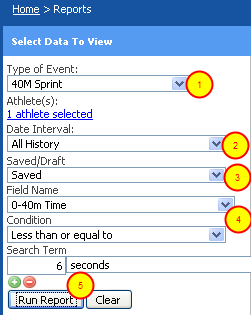 Most athletes will not have access to the reports module as you can see all of your history in the "My History" Module. You can create Reports for any type of Event you have entered information for. Reports differ from Athlete History because you can filter out any unwanted fields, and select exactly what fields you want to view. #5. Select "Run Report" as you can see the most recent data for your athletes is shown. "Clear" will clear all of the data and allow you to create a different report. 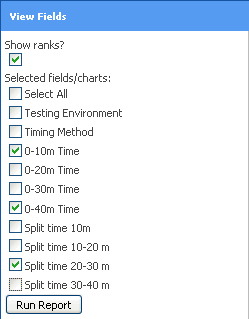 Place a tick in the "Show ranks" tick box to include ranks of all numeric variables in your graph. Report: what can you do with the Report Information? The Report in the Example shows that all of the data for the 40m Event, excluding the times over 6sec, is ranked and compared to the 40m time performance standard. 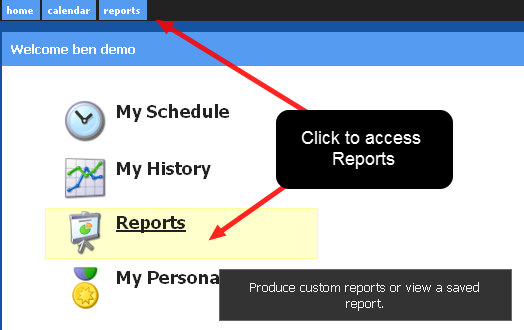 To run a new report or see your saved reports select "Clear" and the current Reports screen will be cleared (as shown in the image in the step below) and you can access any saved reports. Access manuals and lesson about how to track and monitor your data in your custom built software application. Access manuals and lessons about how you can enter and track your own data into your unique software application.